Combine the flour, baking powder, icing sugar and salt together in a mixing bowl. Add the Stork Bake and beat the mixture with an electric mixer. Shape the dough into a ball, press it a flat and cover in cling wrap. Please the dough in the fridge to chill for at least an hour. Roll the dough out and transfer the dough to a 20cm lose bottomed tart pan and cut off the excess dough. Chill the crust for another 30minutes before baking. Bake the tart crust at 200ºc for 15 minutes, then remove the baking paper and beans and continue baking the crust for another 5-10 minutes or until golden brown. Remove the tart crust from the oven and allow to cool. 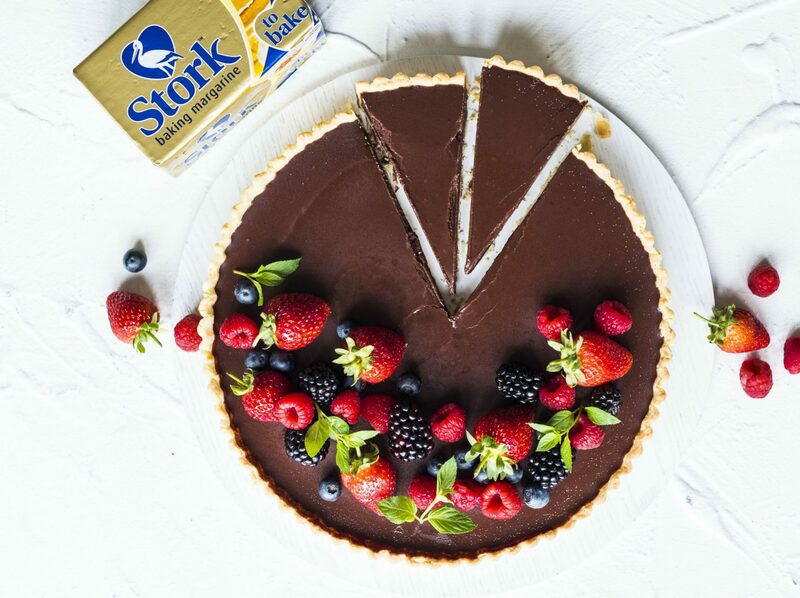 Chop chocolate into small chunks and place in a bowl with Stork bake. Meanwhile, pour the cream into a small saucepan over medium heat and allow to simmer slightly. Pour the cream over the Stork Bake and chocolate then allow to stand for 5min before stirring. Stir the chocolate mixture until all the ingredients are fully combined. Pour the ganache into the cooled tart shell and place in the fridge for 1 hour to set. Top with fresh berries and mint.